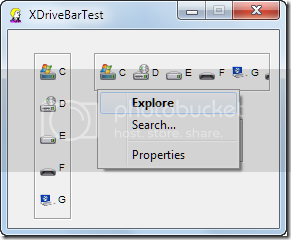 XDriveBar is a small freeware that allows you to access disk drives in a small window instead of going through the traditional way, i.e. by clicking on ‘My Computer’. It shows two drive bars, one vertical and one horizontal. Whenever a new disk drive is added (pen drive, hard disk, etc) the new device is automatically displayed. To open any drive in the list showed, all you need to do is simply right click on the drive and then click on the explore button.